Well I did it! The quilt is done. All the way done. Well I guess I lied again. There is no label…that will have to wait until after the wedding because it is 8:30 Thursday night as I write this. There are supper dishes to do, taco meat to make, a card basket to make, a vehicle to load and toilets to clear and there is just me here to do it. No time for a quilt label. We are decorating the reception hall tomorrow and all the kids will be home. Then tomorrow evening is the wedding rehearsal…then the big day Saturday is the wedding. Outside pictures are so much nice but right now we are a mess of melting snow. I’m not going to complain about it but it’s just not conducive to outdoor picture taking. This is the hardest and more time consuming quilt I have made. I don’t want to scare anyone away from trying to make one because in all reality, it wasn’t hard to make once I got a system going. If you’re thinking about making one or are just curious to know about construction, you can check out link to a blog post I previously made about the quilt’s construction. I did end up binding the quilt by machine. It wasn’t a problem for me at all. I had bound the other double wedding quilt I made by machine but this quilt has much smaller pieces making the rings much smaller. I didn’t know if it would still work but it did. I had Kelli pick out the backing and I first I didn’t like it at all…but now, I do. I couldn’t figure out why a green back on a blue quilt but it actually looks good. When I made this quit I cut too many pieces. At first I really kicked myself for “wasting” the fabric but you know…in 2016 it will be our 30th wedding anniversary. Maybe it’s time I have a double wedding ring quilt for me. Time will tell, but that plan is brewing in my mind. Well as of today…I have three wedding quilts made. I have two more kids to get married….I was already told by one of them that they’ll be wanting a double wedding ring quilt too. I also have a big suspicion that my daughter Kayla who got married first of the kids is soon going to throw a protest. When I asked her what she wanted for a wedding quilt I think she purposely didn’t pick a double wedding ring as she knows that they are hard to make…now that she knows I can make them, I am betting at about their 10 year anniversary she’ll be coming back and wanting one. Now with any luck I’ll get a picture of the bride and groom holding the quilt. Today, we are hooking up with……Confessions of a Fabric Addict, Link a Finish Friday, Freedom Fridays, and Crazy Mom Quilts. 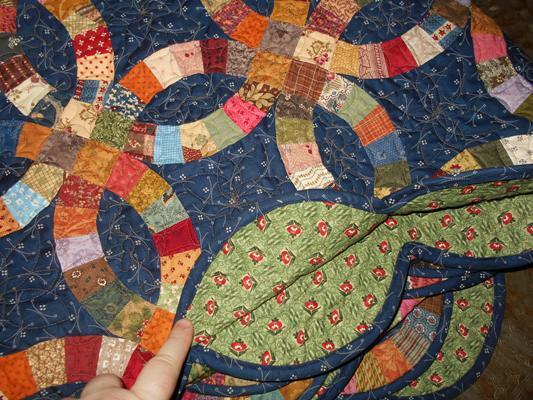 This entry was posted in Finished Projects, Quilting, Uncategorized on March 14, 2014 by Jo. Jo it is absolutely beautiful! The quilt is beautiful! Have a wonderful time with your family. All the best to the bride and groom! Thank you for sharing the journey to the wedding on your blog! The quilt is gorgeous! Have a wonderful time at the wedding tomorrow! Is it auspicious that your daughter is getting married on National Quilting Day? 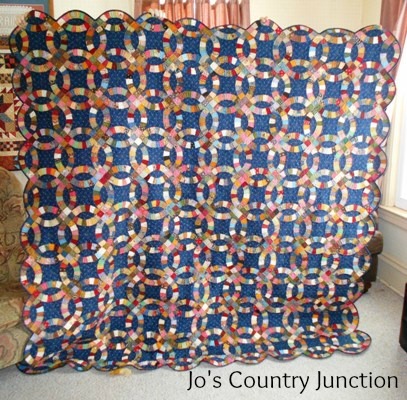 Beautiful quilt, Jo! Every blessing to Kelli and Jason. May their lives be filled with love. 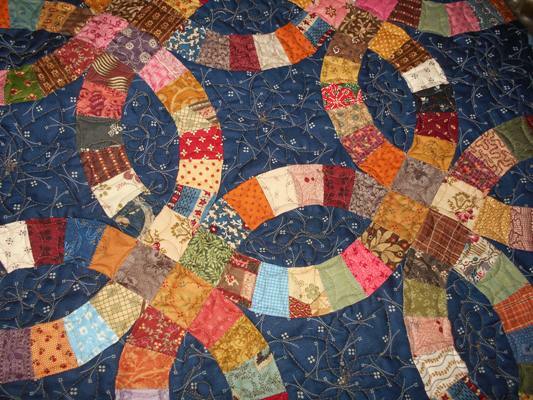 My sister and I made a Double Wedding Ring quilt when we first started quilting, but we did solid rings. It went much faster. What a beautiful quilt. I understand the addiction to challenging quilts. It’s a pain to figure them out, but once you do they’re so much fun it’s hard to make just one. Have fun at the wedding tomorrow! Beautiful quilt! Wonderful job Jo! Many blessing on the young couple and best wishes for their future ! I would love to make one of these, but I really don’t have the confidence that I could. Yours is beautiful!! Congrats to your family…and blessings for your daughter and her new life together with her groom. Beautiful quilt! I would never attempt a double wedding ring on my own. Curves scare me! So beautiful! Lucky kids to have such a talented and generous mom! It is a lovely quilt. You did a wonderful job. And of course, they are all going to want one. You might as well get started on the next one:) Best wishes to Kelli and Jason. Congratulations on a beautifully stunning finish! Truly an heirloom to be cherished for years to come! Green and blue go together because it is the colour of green grass and sky! Beautiful quilt! Beautiful! So unusual to see a DWR quilt with a dark background instead of light, but so rich and vibrant. The green backing complements it nicely. Your daughter is very lucky to have her mom make this lovely quilt for her wedding! Best wishes to all. That’s an impressive finish! A quilt like that would take me years, but I suppose you had a good reason to get yours done ASAP. I love the backing Kelli chose. I really like the way blue and green compliment each other. Congratulations to all of you! Super job, Jo! It’s beautiful. You do such great work. I know you have a lot to do for the wedding, but I hope you take some time to enjoy yourself. Best wishes to Kelli on her special day. That quilt is one of the prettiest quilts I have every seen. It absolutely takes my breath away. Since your daughter knows the love, time and dedication it took to make the quilt, and how you give of yourself without hesitation, I’d say it’s a win-win all around! That is one beautiful quilt! I may just have to make a DWR with a dark background….I think there’s a good sized piece of a darker blue fabric on a shelf in the basement…I wonder if there’s enough…. My Best Wishes to the almost-newly-weds. By Sunday you can all relax. Weddings are fun but stressful, especially when it’s a daughter getting married. Will be thinking of you tomorrow. What a beautiful quilt! Your daughter will have a very valuable keepsake — lucky girl! Congratulations! I love your quilt. Any possibility that you’ll write a post about how you machine apply the binding on a DWR? Your having done two of them has really encouraged me to attempt one of my own. That is one of the most beautiful quilts I have seen. What a special gift to your daughter and new son. Congratulations on your accomplishment, and to the bride & groom!!! Beautiful, Jo. I knew you would finish it in time. I am sure they will treasure it. It’s BEAUTIFUL! Well done on completing it while everything else is still going on!! This is a gorgeous quilt. Your daughter and her new husband will certainly have an heirloom to keep them warm. Congrats on the finish, and best wishes to Kelli and Jason. The wedding quilt is beautiful! Now I want one LOL! Best wishes to the lucky bride and groom. Jo, the quilt is absolutely lovely! The colors are terrific and I like the backing too! !